You can now support openSNP on Patreon and pledge a small monthly amount to help us out in running the service. Even if you just chip in a single dollar per month, this would already help us a lot. Some of you already do, thanks for that! To give this move some context: Since 2011 we – Helge, Philipp and Bastian – have been running openSNP largely from the money we earn in our dayjobs. We do this because we believe in running a community project around personal genomics. But with the growth of openSNP we had to move the project to a higher number of larger servers, which means that we have to spend more money as well. This is why we’re now also going for the last step, marrying open source and open science with crowdfunding. Nearly 20 patrons are already contributing, including one of our larger contributors, Seven Bridges. So far everything needed to run openSNP was living on a single machine with slow spinning disks — this became more and more unsatisfactory the larger the database grew. We compartmentalized the architecture and moved the different parts to their own virtual servers. The fact that the new servers are backed by SSD storage brought the most significant improvement in terms of performance, specifically for the database. The background jobs got their own machine as well, so they don’t interfere with other applications by eating up all the resources. With this we wish all of you happy holidays and some fun science in 2016! tl;dr: As openSNP has grown so much we will now really have to upgrade our servers – they’re straining right now already. If you want to chip in, you can support us with a small monthly contribution on Patreon! Since our last post in April we’ve grown quite a bit, right now we’re hosting ~2100 genetic data sets. Those are largely 23andMe/Ancestry/FamilyTreeDNA genotypings with a few exome data sets. In total this translates to around 1.5 billion genetic variants stored! 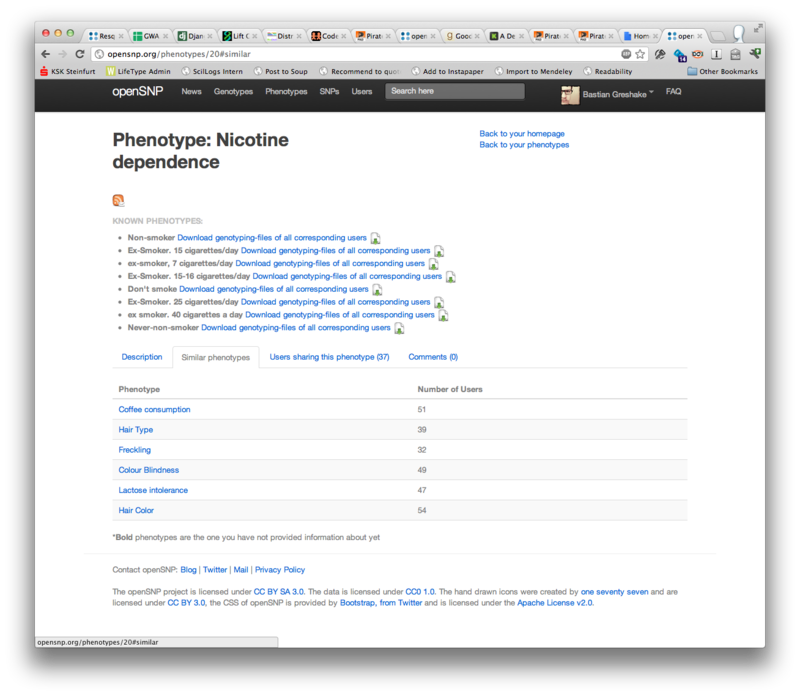 Add to this all the phenotypes stored in openSNP and we are talking a substantial amount of data. While we are very happy with the growth of openSNP, but at the same time this means that our small server, which is running all of the project, is hitting its limits right now. You will have noticed that using the website can be tedious at times, to the point of your connection even timing out. This is largely because the web server is running on the same machine as the backend, and processing new uploads and maintaining the database backend consumes lots of resources. To get around those limitations we will have to upgrade our technical infrastructure. Unfortunately doing so will not come for free. So far we have been running openSNP mainly on our own money that we make on our day jobs. This means we are somewhat limited in how much we can shell out to in order to keep openSNP running. 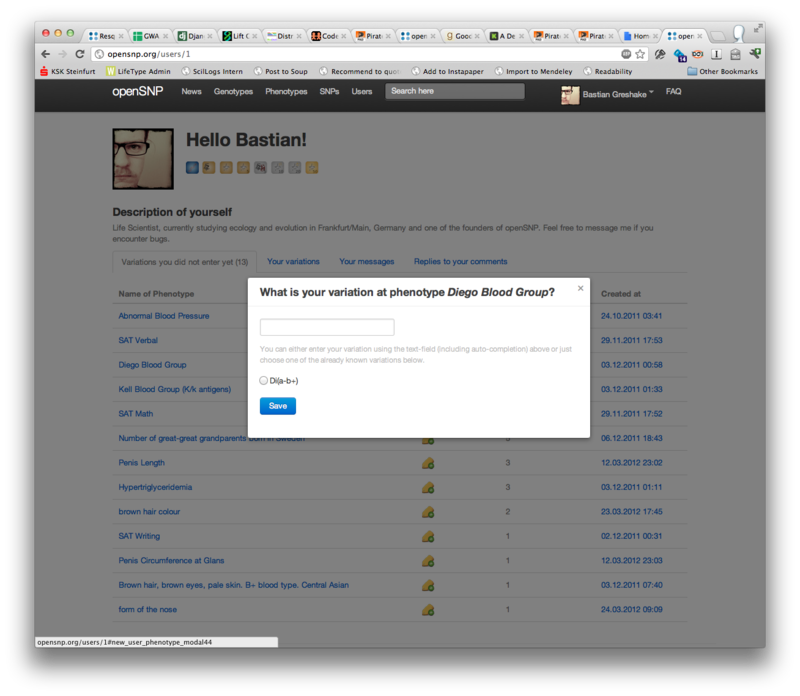 As the huge amount of data in openSNP already shows the power of crowdsourcing we are now reaching out to you! Using Patreon you can support us with as little as $1 per month. We estimate that with around $100 to $150 per month we could substantially improve the speed of openSNP, switching to servers with more RAM, more disk space and faster CPUs. Thanks a lot to those who have become our patrons already. And as usual: Feel free to get in touch any time you have further questions regarding the project at info@opensnp.org! We would like to again thank all volunteers who’ve made this possible. You rock! 1000 genotypings, and 3 years of openSNP! In 2011, someone asked me how many genotypes I personally would expect users to upload, and if I remember correctly, I said 30. That was quite the understatement: Just a few days ago on the 30th of May, openSNP received its 1000th genotyping! On this happy occasion we thank the users and participants for their trust in the project and their continued support and interest. Since 2011, people have used openSNP in research, art, and their own projects, have written additional software to interact with openSNP’s API, written great comments, and much more. We have published a paper on openSNP a few months ago, which is for most of us the first publication in our careers. That was nearly exactly 3 years ago! Since then we’ve (among other things) learned to write proper commit messages. So what does the future hold for openSNP? A better server: We recently received a grant from Bayer HealthCare so we can move to bigger servers, so that the site should load and react much faster. Maybe we can even start hosting bigger datasets? Pre-given phenotypings: One of the biggest problems with openSNP’s data is the high amount of variation in phenotypes entered by users: researchers who want to work with the data still have some manual cleaning to do. We’ve prepared a set of phenotypes for which users can only choose their variation; this should greatly improve the speed with which researchers can start working on the data. Faster parsing: we’ve replaced the Ruby-based genotyping parser by a 99% complete implementation written in Go. So far, it’s much much faster, but still only marginally tested. 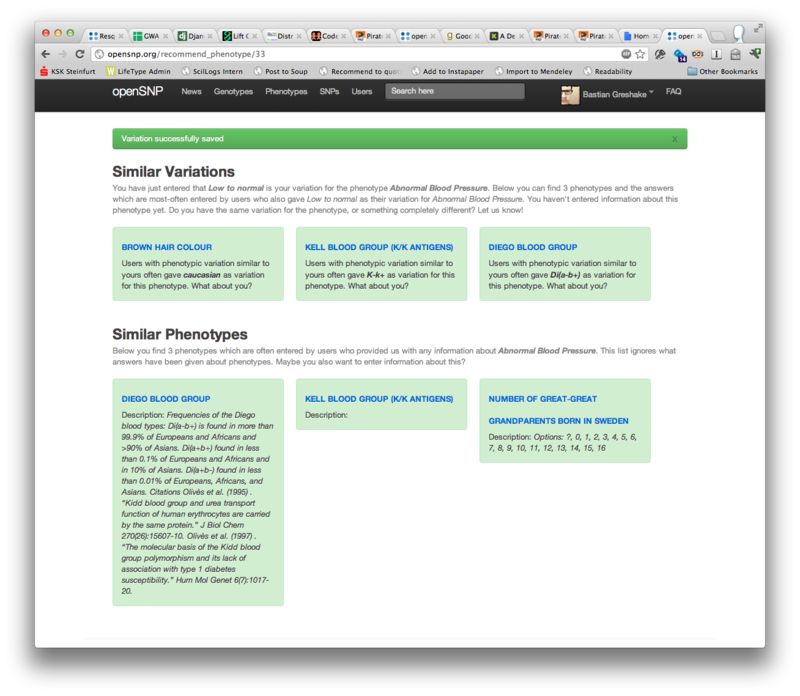 A variety of smaller things: A stats-page, bug-fixes, genosets, etc. – have a look at the Issues page here. We thank you for your continued support and interest, and here’s to many more years! If you know of any other project that uses openSNP data, feel free to post it in the comments! We hope that you all had nice holidays and made it safely into the new year. You may already be tired of all the donation campaigns which are frequent in this season and don’t worry, we won’t ask you for money for openSNP. We do however have some ideas on what you could spent your Christmas bonus: Crowdfunding startups and products became en vogue in 2012 and the whole Quantified Self and Personal Genomics movement fortunately has jumped on the bandwagon as well. Right now there are some projects looking for funding on Indiegogo. For example uBiome, which wants to provide insights into the bacteria living inside you, and Talking20, which wants to do for your proteins what personal genotyping companies did for your genome. We feel that those projects are picking up where the genotyping and genome/exome sequencing efforts of other companies are currently ending and thus might be of interest for you as well (I mean: Who wouldn’t like to get his microbiome sequenced and have regular metabolite tests? Right?). And of course, we hope that we can include sharing capabilities for willing participants of those projects in future versions of openSNP. We have reached out both projects to get some more information about their ideas and future plans of possible collaboriations. Before we let the projects speak for themselves just a standard disclaimer: We’re not involved with any of those projects and are not making any money out of this. We just like the idea of people having more biological data on themselves. Hello, openSNP Community! I’m a PhD student at Oxford, and together with my co-founders from the University of California, San Francisco, I am honored to work with uBiome, the world’s first citizen science effort to map the human microbiome. The project is funded through crowdfunding at www.indiegogo.com/ubiome. Each gut kit is $69; gut and mouth kits are $139 for both (+$12 shipping outside the United States for each). We plan to send out the kits in May 2012 and return the results on our website once we get the kits back from everyone. Our kits are available in 196 countries. Data will be freely available to those who sign up, and available to the global research community on an “opt-in” basis. In the long run, we hope to integrate with 23andme and other types of genetic and metagenetic data. So far, our project has garnered over $55,000 in crowdfunding from over 480 participants in less than a month. Participants from twenty different countries spanning four continents have pledged their support, including the United States, United Kingdom, Australia, New Zealand, Canada, Finland, France, Germany, as well as India, Singapore, and Uruguay. We’ve been featured so far in Wired, Venture Beat, the Los Angeles Times, Scientific American, BoingBoing, and syndicated in 160 newspapers around the world through the Associate Press. What is the microbiome, you ask? The microbiome are the bacteria that live on and within us. It sounds kind of funny, but all of us are actually covered in helpful germs (or co-evolved symbionts if you prefer). Like the rainforest, the healthy human microbiome is a balanced ecosystem. The correct balance of microbes serves to keep potential pathogens in check and regulate the immune system. Microbes also perform essential functions such as digesting food and synthesizing vitamins. Some research also suggests that microbial activity influences mammalian mood and behavior. Studies have linked microbiome imbalance to autism, depression, and anxiety, as well as many gut disorders, eczema, and chronic sinusitis. Infant health even appears to benefit from a proper seeding of microbes at birth, with health consequences ranging into adolescence. For some future-thinking commentary on the microbiome, check out this interesting editorial in Science by Leroy Hood. uBiome brings this cutting edge technology directly to consumers for the first time through citizen science. We provide participants with a catalogue of their own microbes, detailing the microbial composition of the body and explaining what is known about each genera of microbe. In addition, uBiome compares participants’ microbiomes with scientific studies on the role of the microbiome in health, diet and lifestyle. uBiome also provides personal analysis tools and data viewers so that users can anonymously compare their own data with crowd data as well as with the latest scientific research. Diet: Certain gut enterotypes are strongly associated with long-term diets, particularly protein and animal fat (Bacteroides) versus carbohydrates (Prevotella). Maybe you are not sticking to your diet as much as you think. Diabetes: Does your gut microflora correlate with people who have diabetes? If you have other symptoms as well, you might want to talk with your doctor. Sinusitis: Is your nasal microbiome associated with the profile of chronic sinusitis? Some studies have found that multiple, phylogenetically distinct lactic acid bacteria were depleted concomitant with an increase in the relative abundance of a single species, Corynebacterium tuberculostearicum. Alcohol consumption: Do you drink a lot of alcohol? If your gut profile clusters with heavy drinkers, you might want to consider cutting back on the booze. Bowel conditions: Do you have Irritable Bowel Disorder (or any other bowel condition)? You may want to purchase our specially designed kit and survey for bowel disorders. Please join us and help us spread the word about this project. The more people that contribute, the more we can all learn about our health, and contribute to the advance of SCIENCE! Talking20 is a simple blood test that can be ordered online and received in the mail. It’s quick and easy! Results are delivered online in secure profile, and can even be viewed from a smartphone. We are ready to gather data and design experiments that will help us help you learn more about what’s going on inside your body! Get involved with the Talking20 project by ordering a basic kit and sending it in. Tracking your biological data will help you view changes taking place inside your body, and it will help us design new tests that are useful to everyone. Want to know what eating a burger does to your cholesterol? Interested in tracking stress reduction over the course of a month-long yoga course? We are and we need your help. Your body is talking to you, let’s find out what it’s saying! Talking20 is taking proven technologies: (1) dried blood spot collection (done for every newborn in developed countries) and (2) mass spectrometry (used in labs everywhere), and innovatively bringing them together. We believe that actionable information about our bodies are available by looking at our proteins and metabolites. That’s where we need to be looking. Danny Hillis of Applied Minds does a amazing job of explaining this concept in his talk at TEDMED. Mass spectrometry is a very sensitive method for counting molecules from blood, and is actually used as the ‘gold standard’ to set up hospital tests. With a bit of extra work, mass spec can also be used to measure every other molecule too. Without visiting a lab or even leaving your home, you can now just put a few drops of your blood on a card and mail it to us at room temperature from anywhere in the world! We can then do the analysis and tell you your results wherever you are! Talking20’s commitment is to make this testing as economical as possible, so you can do it whenever you want. Heather has personally tracked her hormones and cholesterol every few days to learn more about her own life events and diet. Talking20 is also on the verge of completing a cortisol test so we can start watching stress levels in response to different types of exercise! At Talking20, we want to make many different tests available, so you can start finding out about what is happening inside you. We are offering five of these ‘biomarkers’, to measure your cholesterol, vitamin D, estradiol (estrogen), progesterone, and testosterone. This would normally require you go into the doctor, then into a lab to get a blood draw, and then back to the doctor, and would likely cost $300-500! We believe we can do better! If you want to support them you should visit their Indiegogo page.